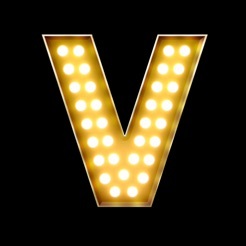 Download VEGAS (the app) to get discount tickets and deals for all popular Las Vegas shows, acts, clubs, tours and entertainment. Whether you are looking for tickets to one of Las Vegas’ most popular shows, a spot at the best Vegas Party Pools, a pair of coveted VIP Line Passes to one of Las Vegas' legendary nightclubs, or to experience one of the many spectacular tours and exciting attractions Las Vegas has to offer - VEGAS (the app) has ticket discounts and deals for you. LOW PRICES, GREAT DEALS. We save you money by offering the lowest prices possible on select events through our featured deals. AVOID THE LINE. Why wait? 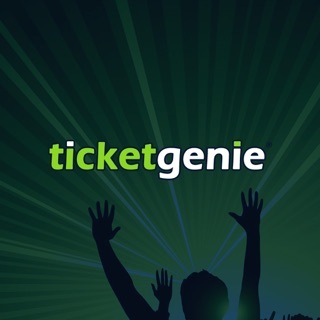 Buy your tickets in seconds from an iPhone or iPad. POPULAR SHOWS. Get cheap tickets for the hottest shows, acts and events in Las Vegas. REAL TICKETS, RIGHT NOW. As an authorized seller, our tickets are guaranteed and available in seconds. Unlike similar Las Vegas apps available on the store, we do not operate as part of an affiliate network – simply passing your information on to another vendor in exchange for a fee; nor are we just another Vegas website scaled to fit your phone. 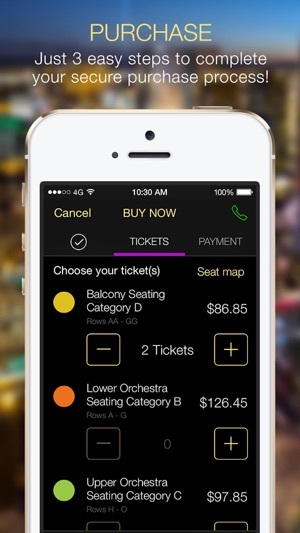 VEGAS (the app) is a mobile ticketing application designed specifically for your iPhone. We contract directly with every Las Vegas show, tour, attraction, and club available on our platform to bring you a wide array of Las Vegas entertainment options at great prices, along with some of, if not the, lowest service fees in Vegas ticket business! Designed and built by Golden Gekko, one of the largest & most successful app developers in the world, and winner of 2013 Best Developer of an Enterprise App* - VEGAS (the app) is the fastest, most convenient, and secure way to get the Vegas tickets you want! 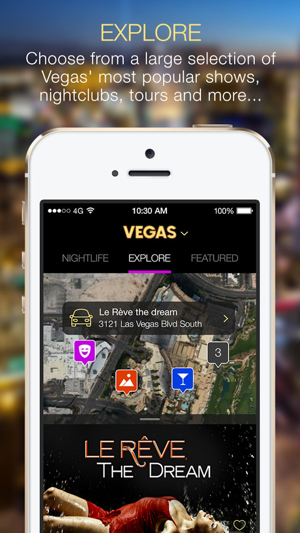 VEGAS (the app) - we put all that Las Vegas has to offer on your phone and at your fingertips! Coupons, but the coupons were nowhere near to be found. Waste of time! Uninstalled! Finally! Vegas has been waiting for an app like this and I’m surprised it took this long for someone to build it. 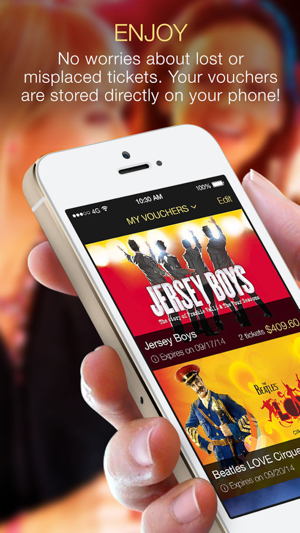 The app aggregates tickets to a ton of shows and events around the city, so there is definitely something for everyone in it - Big Broadway Shows, nightclubs, river tours, etc. It’s really easy to sort by whatever you’re interested in as well as by day and time. The ticket prices are heavily discounted and as inexpensive as I’ve seen anywhere. Purchasing tickets was simple and fast and it stores the electronic ticket right on your phone just like the Airline Apps, so we didn’t have to print anything or go to any box office. Overall, this was a great app experience and I’ll use it every time I go to Vegas. This app has a really nice, clean, professional interface. The underlying mechanics are great -- it scrolls and changes pages instantly, the buttons are prominent, and the organization is logical. Doesn't send you to an external site to buy tickets either, it's all done through the app. Hoping it expands to more locations!